Reports of an imminent demise of McLaren-Honda’s partnership, a pairing full of failure (literally) and sadness, in Formula One are everywhere. It’s expected to be official within days, and even Bernie Ecclestone said McLaren’s switch to Renault engines is a done deal. 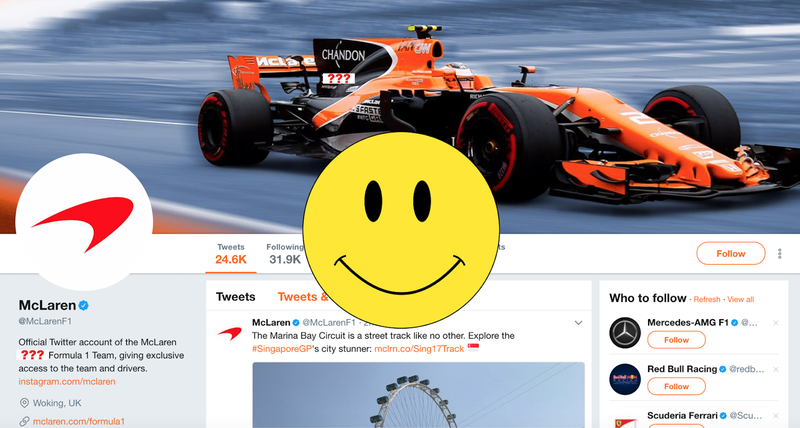 But things are fine on McLaren-Honda’s Twitter account—why wouldn’t they be? Really, everything is going swimmingly over there. Don’t let all of these reports get you down. Why talk about Honda when there are happier topics? See, here’s a cute GIF that shows the team really is excited for another race weekend of Honda-powered misery and awkwardness after the rumored breakup! And here’s a handy travel guide for your next vacation to Singapore. It’s a shame that sponsor money from Hilton can’t go toward making a better race engine, right! Forget about the engines. Enjoy the awkward pose that happens when two manly men who definitely don’t want to touch each other—because that would be weird—try to take a photo together, courtesy of Stoffel and and Fernando! And here, the McLaren team spies some trucks that have better engines than its Honda-powered race cars. Oh, look! What a cool poster. Cartoon faces, very cute! Nothing to see here at the McLaren F1 team, folks, other than Fernando Alonso hanging out in his beach chair without a fire suit on and dreaming of places he’d rather be, like NASCAR or IndyCar (without a Honda engine, of course). There you have it, everyone. Things are totally fine over at McLaren-Honda, and really, they don’t know what you’re talking about.